"Refrigerated biscuits with cinnamon bake in a tube pan. 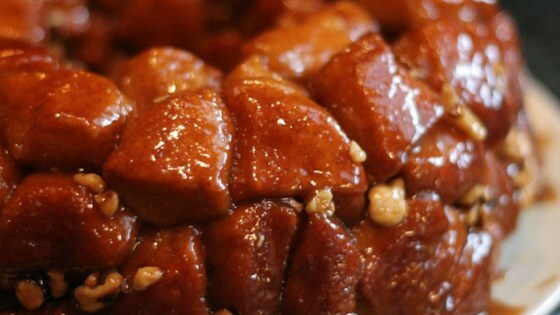 My 7 year old daughter, Leah, loves her Monkey Bread. Enjoy!" Use only solid tube pans for this recipe. Hot syrup will leak from removable bottom pans. I used 2 cans of biscuits instead of 3 and it was good. There was not enough of the icing on all of the bread if you used 3 cans. Quick and easy. I added 1 teaspoon of vanilla to the caramel sauce while cooking. YUMMY!!! !